Here are the subways socks (in Queens!) because with the foot over 6.5 inches long—it won’t be long before I am starting the toe. And then it’s a hop skip and jump to being done! I expect the finished sock to be about 9 inches long. And none too soon either, since I am heading off this holiday week end to visit family (and this blog will likely be silent—or nearly so) for a week—and these socks will be a perfect ‘go with’ one of the outfits I am packing. Knit Kit 2 has been settled—more socks. (More Kroy) a black and white blend—it doesn’t look like it is striped-- but I plan to add stripes—solid black ones. And maybe, because I’ll have some handy, some white ones too! I like (d’oh) Patons Kroy sock yarn—even if the Fx sock yarn skeins are too small. Kroy is generally a nice value yarn—Usually $4.95 or so a skein—and with many of the various lines, 2 balls makes a pair of socks. 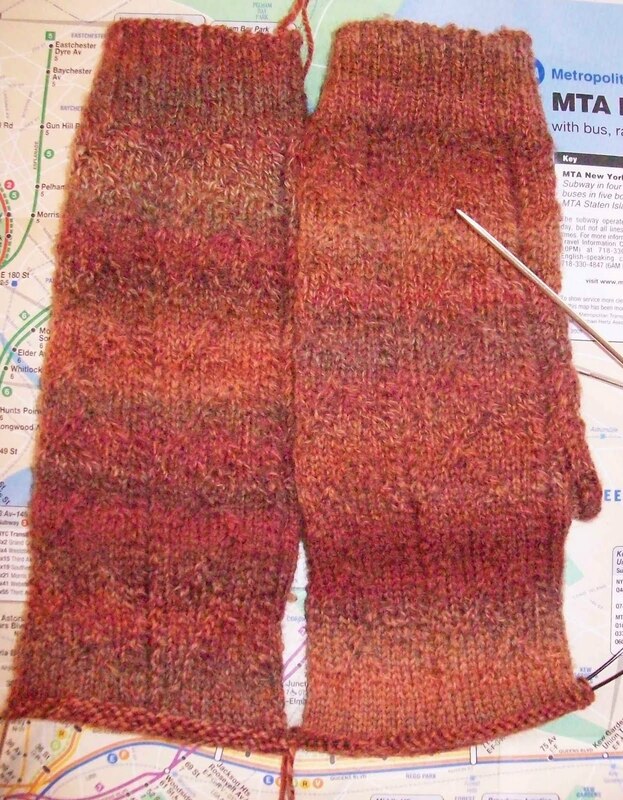 Not so with the Fx—you need 3 skeins --(or short sock—or small feet). It goes on sale (not frequently but not infrequently either) and you can often find coupons for Michaels/ACMoore/JoAnnes—some of the big box craft stores that carry the Kroy lines. But when you need 3 skeins ($15) –it’s getting up there—and less of a value. Still these coppery socks are very pretty—as is the cascade colorway (Cascading Waters Sock) and the clover colorway (the prettiest of the lot, I think!) will make some lovely socks. 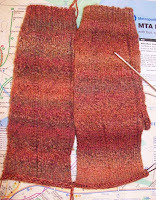 But the solid color Kroy has almost 50 more yards—enough for a sock and some left over—per skein. And I LOVE let over bits! I love watching these grow every time you post. That is a gorgeous color! Love those socks. Also, I've always wonered about the Osage Orange ever since reading about it in the Wilder books. Thanks for the link to the page about them.